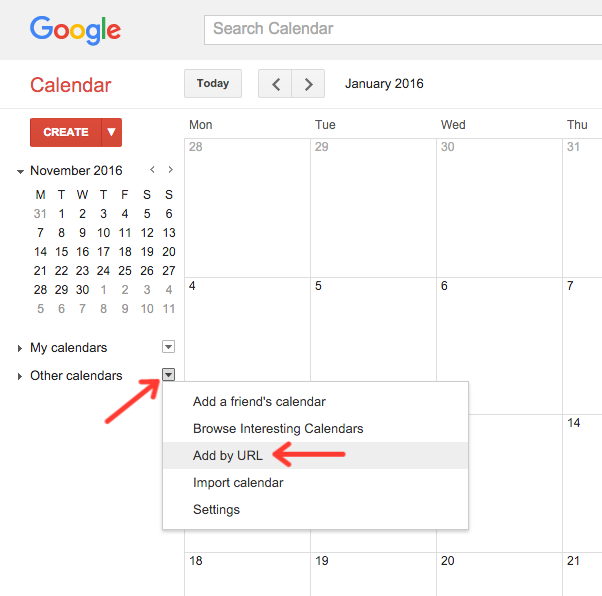 To view your events in another calendar (like Google Calendar), you must connect or subscribe to your calendar feed URLs as found on your schedule setup page. The connection method is different depending on what calendar you use (for Outlook and Apple see the end of the article). The public feed shows the event title, location, all event details, and a link to the public event page for that event. The private feed in addition shows the names of the booked attendees and has a link to the admin bookings list page instead of the public event page. The private feed (sparse) is similar to the private feed, but will only show dates and times that have bookings associated with them. Both feeds are limited to showing events from 3 months ago to one year in the future. Use the menu option: "File - New Calendar Subscription..."